This is a map of every star within 50 light years visible with the naked eye from Earth. There are 133 stars marked on this map. Most of these stars are very similar to the Sun and it is probable that there are many Earth-like planets around these stars. There are roughly 1400 star systems within this volume of space containing 2000 stars, so this map only shows the brightest 10% of all the star systems, but most of the fainter stars are red dwarfs. There is also a negative version of this map, which might be easier to print. This is a list of all the stars marked on the map. This is every star brighter than magnitude 6.5 within 50 light years, so all of these stars can be seen with the naked eye although most of them are quite faint. This list contains every G-type star within 50 light years. The Sun seen from a distance of 50 light years would be a magnitude 5.8 star, so it also would be a faint point of light barely visible with the naked eye. Alpha Lyrae              18 36.9 +38 47   67.5 +19.2  A0V                 0.03  0.58 128.93 25.30  Gl 721   Vega            Surrounded by a ring of dust at 80AU. number in the "Harvard Revised" Bright Star Catalogue. Column 2: The Right Ascension in hours and minutes for epoch 2000. Column 3: The declination in degrees and minutes for epoch 2000.
be listed as type G0V in another. Column 9: Parallax in milli-arcseconds usually from the Hipparcos catalogue. Column 10: The distance in light years (=3.2616/parallax). Column 11: The number of the star in the Gliese Catalogue of Nearby Stars. Column 12: Proper name of the star. ESA, (1997), The Hipparcos Catalogue. Hoffleit D, Warren Jr W, (1991), Harvard Revised Bright Star Catalogue, 5th Edition. Gliese W, Jahreiß H, (1991), Third Catalogue of Nearby Stars. 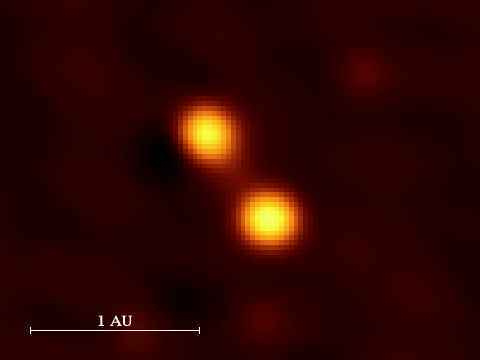 The star Capella is revealed as a pair of yellow giant stars in close contact with each other in this high-resolution image from the Cambridge Optical Aperture Synthesis Telescope. The orbital period of the two stars is 104 days.